Sometimes it's painful to a writer to label his work, as if putting a name to it reduces its parameters. In saying what it is, you are also saying what it is not, and in doing so you might deny the ultimate strength of literature—to be layered with possibility. If love has gone from noun to a verb, I no longer want part. Lately, the moon has edged slow through the sky dragging Jupiter, the closest its been to the earth in some decades. It winks back like Sputnik, like Skylab. One of a club of dwindling planets. We are known for our exclusivity. Jupiter, tell me: what do you know, and why won't you impart? It knows something we don't. It knows something we haven't quite figured. Throughout The Uncertainty Principle, the mystery of unknowing is a kind of knowledge in itself—knowledge that any truth can be taken away from us, that no truth has permanence. It's an unnerving and beautiful notion. 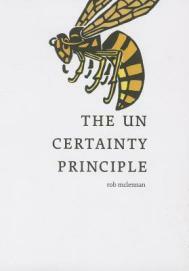 The Uncertainty Principle is also not a book with an answer. Some of its playfulness comes from the one-liners like the “radium” one cited above; they end with the same hashtag, a remnant of these particular pieces' first home on mclennan's Twitter feed. The joke of the hashtag, unfortunately, loses its effect as it’s repeated. The claims made by these pieces are indeed funny and unbelievable, though there's something in their oddness that makes you think, well, maybe . . . That hesitation works within the confines of uncertainty the book presents, but the hashtag corrupts that feeling, asking the reader to chuckle rather than wonder. This is a small quibble, however. The most important part of this book is that it isn't anything. It calls to the idea that uncertainty is always with us. And it shines a light in that darkness, but as the length of most of the pieces attest, the light must not linger on any one thing too long, lest we start believing what we see is true. This entry was posted in Uncategorized and tagged Fall 2014 on November 6, 2014 by Kelly.